Originally focused on critical theory, gradually expanded to the arts, humanities and social sciences. Est. c.2004 by Sean Dockray as part of the Public School. Started as a proof of concept of the Public Library initiative. Est. 2012 by Marcell Mars and Tomislav Medak. Hosted theory and fiction in plain text. Est. 2001 by Sebastian Lütgert/ROLUX. Hosts the works of Marxist, communist, socialist, and anarchist writers. Est. 1990 by Zodiac. Online since 1993. The core of the collection are preprint versions of academic papers in PDF submitted by authors. Until 2016 run by Social Science Electronic Publishing, Inc. (SSEP), later acquired by Elsevier. Est. 1994 by Michael Jensen and Wayne Marr. Started as a resource for visual and sound poetry, soon expanded to the historical and contemporary avant-garde. Est. 1996 by Kenneth Goldsmith. 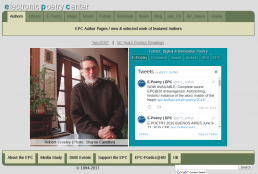 Hosts poetry books and periodicals; also lists contents from Eclipse and Jacket 2 Reissues. Est. 1994 by Loss Pequeño Glazier and Charles Bernstein at SUNY Buffalo. A free on-line archive focusing on digital facsimiles of the most radical small-press writing from the last quarter century. 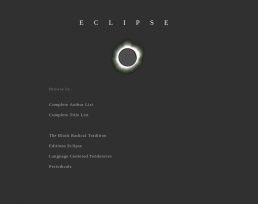 Eclipse also publishes carefully selected new works of book-length conceptual unity. Est. 2003 by Craig Dworkin. An online repository supporting the fair use of copyrighted media by educators. A project of the Media Arts and Practice division of the USC School of Cinematic Arts. Est. 2008 by Steve F. Anderson. Provides mass and public access to 60 million research papers. Est. 2011 by Alexandra Elbakyan. An archive focusing on anarchism. The site also provides an online service, Bookbuilder, to create collections of texts, with editing features, changing layout and rendering to PDFs or EPUBs. Est. c2008. 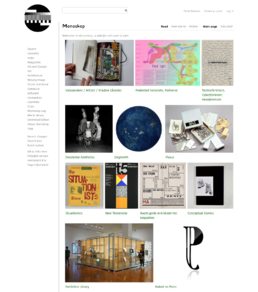 Initially a media art research initiative, Monoskop gradually expanded toward avant-garde media studies. Est. 2004 by Dušan Barok. Monoskop Log library has branched out in 2009. Database initiative for digital objects and publications. Est. 2015 by Erik Wysocan and Benjamin Tiven. A host to 3 million books. Est. 2008. A resource of documents and media related to New Rationalism, Accelerationism, and other recent theory and philosophy. Est. 2015. 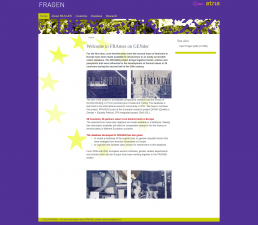 Digital library of key texts of second wave of feminism in Europe. CC BY-NC-ND. Maintained by Atria, Amsterdam. Created 2006-2011. Hosts Francophone works in social and human sciences. 6000 publications from 2000 authors. Est. 1993 by Jean-Marie Tremblay. Maintained by the University of Quebec at Chicoutimi (UQAC). The Oil of the 21st Century: Perspectives on Intellectual Property, conference and event series, Berlin & Umea & Mumbai, 18 Oct-22 Dec 2007. Properties of the Autonomous Archive, Max Mueller Bhavan Library, Mumbai, 7-8 Jan 2011. Video. Public Library events, since Dec 2011. HAIP 2012: Public Library / Javna knjižnica conference and exhibition, Kiberpipa, Ljubljana, 28-30 Nov 2012. Video. An Archive/Live Archive/UnArchive and Public Library workshop, kuda and CK13 Youth Center, Novi Sad, 15-16 Jul 2013. Video. Hack the biblio! Construir bibliotecas publicas, Calafou, Barcelona, 17-21 Apr 2014. Underground E-publishing session within Off the Press: Electronic Publishing in the Arts conference, WORM, Rotterdam, 23 May 2014. Video:    . Public Library: Rethinking the Infrastructures of Knowledge Production conference and exhibition, Württembergsicher Kunstverein (WKV) & Akademie Schloss Solitude, Stuttgart, 30 Oct-23 Nov 2014. Video. Ideographies of Knowledge symposium, Mundaneum, Mons, 3 Oct 2015. Video. Radical Piratical symposium, University of Malmö, 2-3 May 2016. Knowledge Architectures talks and workshops, Tata Institute for Social Sciences, Mumbai, 2-6 Jul 2016. Interfacing the Law, Piet Zwart Institute, Rotterdam, Spring 2017. Seminar in experimental publishing. Pravo na stanovanje, pravo na obrazovanje – javne borbe i javna knjižnica, Omladinski centar CK13 & Galerija SULUV, Novi Sad, 4-12 May 2017. Catalogue. "Caring for the Open: Custodianship, Accessibility" panel discussion at GfM-Jahrestagung 2017: Zugänge, FAU Erlangen-Nürnberg, 5 Oct 2017. Creating Commons workshop, HEK, Basel, 19-22 Oct 2017. Knowledge Architectures: Lahore workshop, Centre for Governance and Policy, IT University of the Punjab in Lahore, Pakistan, 12-13 Mar 2018. Shadow Libraries: UbuWeb in Athens exhibitions and symposia, Onassis Cultural Center & National Museum of Contemporary Art (ESTE), Athens, 16-18 Mar 2018. Booklet PDF. Interfacing the Law (2018), Piet Zwart Institute, Rotterdam, Spring 2018. Seminar in experimental publishing. Artistic Shadow Libraries video installation, within Find the File festival, Haus der Kulturen der Welt, Berlin, 21-24 Mar 2019. Cornelia Sollfrank’s interview montage shows artists creating web archives as commons practice. Interfacing the Law (2019), Piet Zwart Institute, Rotterdam, Spring 2019. Seminar in experimental publishing. Pirate Care, conference, Centre for Postdigital Cultures, Coventry University, 19-20 Jun 2019. CfP. AAAARG Library, a site-specific installation, in conjunction with the the fifth annual NY Art Book Fair, Fall 2010. The Piracy Project by AND Publishing, Andrea Francke and Eva Weinmayr, 2011-2014. A project on book piracy, the concept of authorship and politics of copyright. Video interview with Francke and Weinmayer by Coco Sollfrank, 32 min. Giving What You Don't Have, an artistic research project by Cornelia Sollfrank, since 2012. Bibliotecha, a framework to facilitate the local distribution of digital publications within a small community. It relies on a microcomputer running open-source software to serve books over a local wifi hotspot. Using the browser to connect to the library one can retrieve or donate texts. Bibliotecha proposes an alternative model of distribution of digital texts that allows specific communities to form and share their own collections. Created since 2013 by Michaela Lakova, Lucia Dossin, Yoana Buzova, Roelof Roscam Abbing, André Castro, Lídia Pereira, Ana Luísa Moura, and Lasse van den Bosch Christensen. Worm Pirate Bay, a physical library at WORM, Rotterdam, hosting an eclectic collection of avant-garde media, from zines and books to CDs and DVDs. Visitors can burn DVDs, digitise VHS tapes, and copy books and magazines using photocopier. 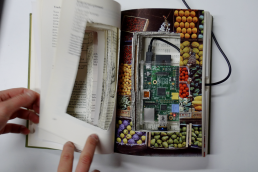 DIY Book Scanner, a community of people who build their own book scanners. Linear Book Scanner, a low-cost open-source page-turning book scanner. Initiated by Dany Qumsiyeh. Tomislav Medak, Dubravka Sekulic, with An Mertens, Book Scanning & Post-Processing Manual Based on Public Library Overhead Scanner, Zagreb: Public Library & Multimedia Institute, [Dec 2014], 22 pp. Underground E-publishing, (2), (3), (4), Rotterdam, 23 May 2014. Video recordings of talks held at WORM. Public Library: Rethinking the Infrastructures of Knowledge Production, Stuttgart, 30 Oct-23 Nov 2014. Video recordings of talks held at Württembergsicher Kunstverein (WKV) & Akademie Schloss Solitude. Ideographies of Knowledge, Mons, 3 Oct 2015. Video recordings of talks held at Mundaneum. "Publishing In Convergence", -empyre- list discussion moderated by Michael Deiter, Morgan Currie and John Haltiwanger, Jun 2010. Jodi Dean, Sean Dockray, Alessandro Ludovico, Pauline van Mourik Broekman, Nicholas Thoburn and Dmitry Vilensky, "Materialities of Independent Publishing: A Conversation with AAAAARG, Chto Delat?, I Cite, Mute, and Neural", New Formations 78, London: Lawrence & Wishart, Aug 2013, pp 157-178. "Interviews with E-Book-Pirates: “The book publishing industry is repeating the same mistakes of the music industry”", Netzpolitik.org, 27 Sep 2013. "aaaaarg lawsuit digest", Nettime list discussion, Jan 2016. "Sci-Hub/LibGen in Blogs and the Media: A Recent Bibliography", compiled by Stephen McLaughlin, 19 Mar 2016. "Libraries Without Walls", trans. Lydia Cochrane, Representations 42: "Future Libraries" (Spring 1993), pp 38-52; rev. as ch. 3 in Chartier, The Order of Books, Stanford University Press, 1994, pp 61-88, n108-112, PDF. Roger Chartier, "Languages, Books, and Reading from the Printed Word to the Digital Text", trans. Teresa Lavender Fagan, Critical Inquiry 31 (Autumn 2004), pp 133-152. James A. Evans, "Electronic Publication and the Narrowing of Science and Scholarship", Science 321:5887 (18 Jul 2008), pp 395-399. Discussion: Gingras, et al. ; Wray; Bartheld, et al. ; Andersen; Evans (2009), Verstak, et al. (2014). Gary Hall, Digitize This Book! The Politics of New Media, or Why We Need Open Access Now, University of Minnesota Press, 2008, 301 pp. Joe Karaganis (ed. ), Media Piracy in Emerging Economies, Social Science Research Council, 2011, 440 pp. Jonas Andersson Schwarz, Online File Sharing: Innovations in Media Consumption, Routledge, 2013. Janneke Adema, The Perseverance of Print-Based Authorship within Humanities Scholarship, 2014ff. Ph.D. Dissertation. Dennis Tenen, Maxwell Foxman, "Book Piracy as Peer Preservation", Computational Culture 5, 9 Nov 2014. Jonas Andersson Schwarz, "Honorability and the Pirate Ethic", ch 4 in A Reader in International Media Piracy: Pirate Essays, ed. Tilman Baumgärtel, Amsterdam University Press, 2015, pp 81-110. Guillaume Cabanac, "Bibliogifts in LibGen? A Study of a Text-Sharing Platform Driven by Biblioleaks and Crowdsourcing", Journal of the Association for Information Science and Technology 67:4, Apr 2016, pp 874-884. Balázs Bodó, "Pirates in the Library – An Inquiry into the Guerilla Open Access Movement", Jul 2016. Paper prepared for the 8th Annual Workshop of the International Society for the History and Theory of Intellectual Property, CREATe, University of Glasgow, UK, 6-8 July 2016. Albert N. Greco, "The Kirtsaeng and SCI-HUB Cases: The Major U.S. Copyright Cases in the Twenty-First Century", Publishing Research Quarterly 33:3, Sep 2017, pp 238-253. Daniel S Himmelstein, Ariel Rodriguez Romero, Jacob G Levernier, Thomas Anthony Munro, Stephen Reid McLaughlin, Bastian Greshake Tzovaras, Casey S Greene, "Research: Sci-Hub provides access to nearly all scholarly literature", eLife, 9 Feb 2018. Joe Karaganis (ed. ), Shadow Libraries: Access to Educational Materials in Global Higher Education, MIT Press, 2018, 313 pp. Contributors: Balázs Bodó, Laura Czerniewicz, Miroslaw Filiciak, Mariana Fossatti, Jorge Gemetto, Eve Gray, Evelin Heidel, Joe Karaganis, Lawrence Liang, Pedro Mizukami, Jhessica Reia, Alek Tarkowski. Joe Karaganis, Balázs Bodó, "Russia is Building a New Napster — But for Academic Research", Washington Post, 13 Jul 2018. Clemens Blümel, Balazs Bodo, et al., "Piratical demand as a form of impact indicator and reaching unexpected audiences", in OPENing UP new methods indicators and tools for peer review, impact measurement and dissemination of research results, 2018, in 50-60. Nanna Bonde Thylstrup, "The Licit and Illicit Nature of Mass Digitization", ch 4 in Thylstrup, The Politics of Mass Digitization, MIT Press, 2018, pp 79-100. 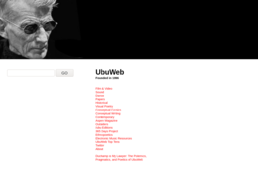 On Lib.ru, Monoskop, and UbuWeb. Petar Jandrić, Sarah Hayes, "The Postdigital Challenge of Redefining Academic Publishing from the Margins", Learning, Media and Technology, Feb 2019. Janneke Adema, "Scanners, Collectors and Aggregators. On the ‘Underground Movement’ of (Pirated) Theory Text Sharing", Open Reflections blog, 20 Sep 2009. 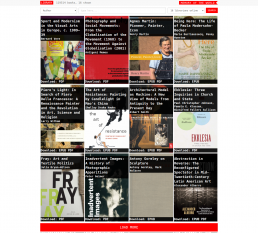 "The Liquid Library", Eurozine, 26 Aug 2013. Sarah Hamerman, "Cataloging Plunder: Thoughts on the Digital Text-Sharing Underground", LIS Theory blog, 20 Nov 2014; upd. as Pirate Libraries and the Fight for Open Information", The Media 61: The Immaterial Digital Labor Issue, 5 Sep 2015. Texts listed on the wiki pages of respective initiatives: UbuWeb, Aaaaarg, Monoskop, Library Genesis. Perseus Digital Library, est. c1987 by Gregory R. Crane, covers the history, literature and culture of the Greco-Roman world. The collection contains editions and modern English translations of hundreds of ancient Greek, Roman, Arabic, Germanic and other texts. Maintained by the Department of the Classics, Tufts U.
Lib.Ru, RuNet's early web library, est. 1994 by Maksim Moshkov. Publichnaya biblioteka, est. 1998 by Vadim Ershov. Library.nu, formerly Ebooksclub (2004-2007) and Gigapedia (2007-2010), closed down in Feb 2012. Open Library, an e-book lending library, est. 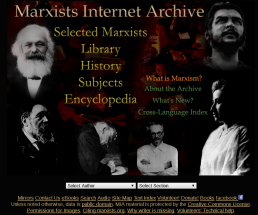 2006 by the Internet Archive. 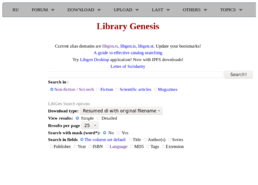 Library Genesis (LibGen), est. March 2008, has multiple interfaces, mirrors and versions   . Sci-Hub, est. September 2011 by Alexandra Elbakyan. Bibliotik, a torrent site for e-books. Cambridge Core, part of Cambridge University Press; 380 journals. JStor, est. 1995 by William G. Bowen (Princeton U); now owned by ITHAKA; 2600 journals. 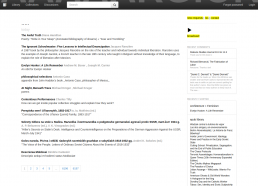 MIT Press Journals, the Journals branch est. 1972, 38 journals. Oxford Academic Journals, part of Oxford University Press; 100 journals. Project Muse, est. 1995, operated by Johns Hopkins University Press; focus on digital humanities and social science; 674 journals. SAGE Journals, focuses on social sciences, 1000 journals. 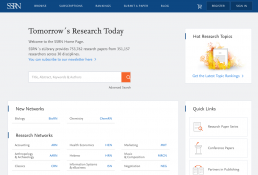 ScienceDirect, operated by Elsevier, Amsterdam, 4000 journals. Taylor & Francis Online, operated by Taylor & Francis Group, a division of Informa plc; 2700 journals. Wiley Online Library, 1700 journals. This page was last modified on 16 April 2019, at 15:30. This page has been accessed 145,552 times.